Deep in the breathing trace of yoga transcendence, I slipped from an intense flow of sun salutations into a moment of restful child’s pose–always a sweet command from the teacher. As I lay on the mat, knees apart and toes together, I rested my head on the mat and took a deep relaxing inhale. But the smell of incense was not what I took in, it was an unpleasant smell of plastic–gross. Most conventional yoga mats are made with PVC, polyvinyl chloride, and other toxic chemicals to give your mat the stick and grip. So this week’s weekly want is a non-toxic, PVC-free yoga mat. With the awareness of yogini’s it is surprising that there are only a few on the market, but our favorite is by the company Jade. 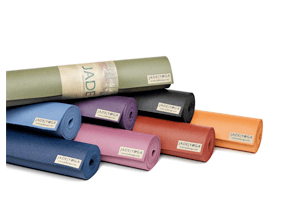 Jade yoga mats are made from real rubber, and you can assure they are PVC and BPA free. Always made domestically in the USA, for each Jade Yoga mat purchased, a tree is planted in partnership with Tree for the Future. I love my Jade mat! It’s a little heavier than others, but it’s extremely high quality, to the point where a teacher has asked to borrow it for demonstrations. I know when I got mine, I was able to trade in my old mat for recycling, too.